China had been using a form of fan since the second century BC. Pictures of feathers under a roof were the source of the Chinese characters for the word fan. 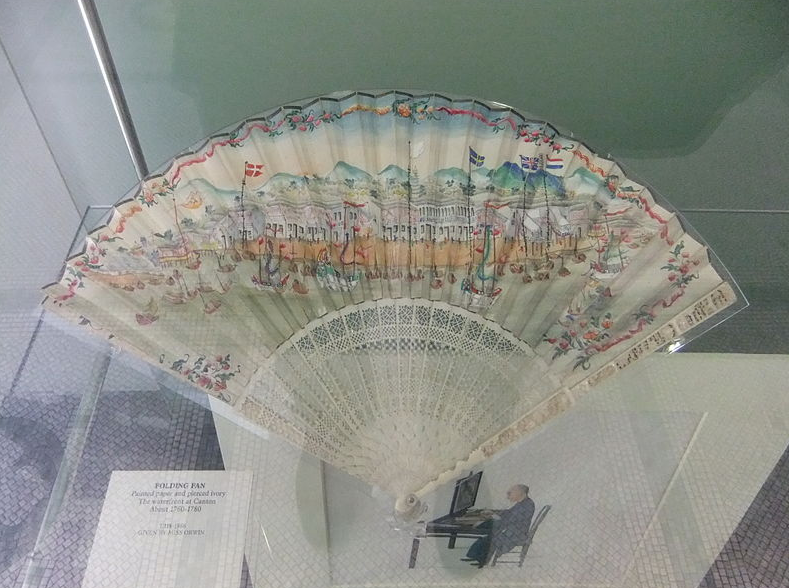 The first fans were fixed or a single piece of material, which the Chinese called “pien-mien” that translates to the verb phrase, “to agitate the air.” And for its size and purpose, the Chinese fan was also used as an identifier for social class as well as gender by its design. Ancient Japan had fans based on Chinese fans since 6th century CE. Japan took the design further and invented the folding fan between the 6th and 9th centuries. The first folding fan was a court fan, which was called Akomeogi, a word taken from Akome, the name of the court women’s dress of that period. While the use of the fan was highly viewed as feminine art in the Far East, the folding fans figured prominently in the histories of Japan and Korea as these seemingly simple cooling implement were turned into weapons. It became called tiě shān or the iron fan in China, the Korean fighting fan or buchae in Korea and tessen in Japan. Europe got hold of the folding fans when Portuguese traders brought them from Japan and China during the 15th century. The fans instantly became popular, particularly with the flamenco dancers of Spain. And by the 17th century, the folding fans from the Far East were being used by women from high society. While the folding fans, a very handy item to keep oneself cool, and later as a prop for court dances in China, Korea and Japan, it also figured prominently in martials arts and combat practices of their armies of old. Movies about samurais, either in live action or in animation, including manga, a folding fan is one of the items usually carried by a samurai, aside from the katana, or samurai sword. This is because the Samurai class of Japan during the feudal times was the one that made full use of the handy folding fans as armament. They called their fan as tekken, which literally translates to war fan. The samurai used two types of fans. One was a solid but open fan made of wood or metal. The second one was an actual fan that could be opened and closed. The ribs or sticks were made of metal or wood while heavily lacquered paper was used for the mount. Metal covered the outside of the fan. It was during the Joseon era when the use of fans for armed conflict or mubuchae, was introduced. Since weapons such as swords and knives were banned during that era, they needed something for protection that could be carried in plain sight. The yangban and the chungin, which translate to the upper class and the middle class, respectively, were the popular users of the Korean mubuchae fans. Artisans discovered that the wood of the Korean birch tree or pak dahl was very resilient and could be tempered to a certain hardness to repel the sharp edge of swords that were in use at that time. The fighting might have ended and the art of the Samurai is now a martial arts discipline, but the use of the fans is still there. Geishas of all types, particularly the apprentice geishas or maiko extensively use folding fans in their dances. Large folding paper fans called harisen are part of the manzai act in comedy shows. Harisen translates to ‘slapping fan’ in Japanese. It’s used by the tsukomi (straight man) to hit the boke (funny man) to exaggerate their jokes or make their idiotic act funnier. Likewise, fans are used as comedic weapons in Japanese manga. In Japan, dances like the noh mai, nihon buyo, kabuki and bon odori use the folding fan as an essential stage prop. 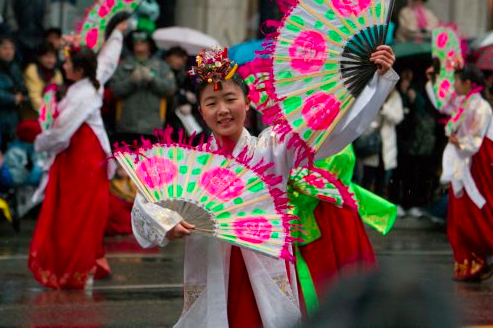 Korea has a fan dance called buchaechum. It is a beautiful traditional dance, performed by female dances during special occasions and celebrations. Wearing colorful hanboks the dancers use fans with pink peony flowers painted on the leaves and used these fans to depict images of waves, flowers, butterflies and birds. During 19th century Europe, society was very strict, and males and females were almost never allowed to socialize without chaperones. The fans became their effective tool for silent communication. This is a fascinating look behind the secret language the folding hand fans of old wielded, giving them a unique way to communicate and defy restrictions. If still single, a woman held an open fan to cover her mouth and held it with her right hand in front of her face to tell a man to follow her. If she opened and closed her fan to point in the direction of the garden, that is where they would meet. 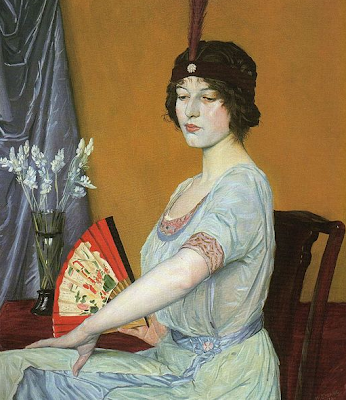 Asking the question of whether he loved her was the interpretation of a woman holding a fan closed while looking at the man, while she wanted to talk to the man when she touched the edge of the fan with her fingers. Folding fans during that time were attached to women’s waist. A dangling fan indicated that she wanted to remain friends. If a woman fanned herself slowly, it was interpreted as her being married, while when she fanned herself vigorously, the man took it that she’s already engaged. An invitation to kiss was signaled by holding the fan to the lips while striking a closed fan with the left hand translated to “please write.” Women desired to be acquainted when they carried their fans in front of their face with their left hands. Lovers could indicate the time when to meet depending on how many ribs of the fan were shown. Slowly closing a fully opened fan translated to a promise of marriage. However, jealousy was indicated when the woman touched the tip of her nose with her fan. These are just of the ways the fans were used by the ladies to communicate with gentlemen in subtle ways during the restrictive years in the 19th century so as not to be caught by their chaperones. Quite interesting and very innovative ways of silent communication, just like the codes and passwords used by spies. Very intriguing, indeed. I love this post! I love fans! I am saving this post! The meanings are so beautiful. I came across some beautiful cream fans at the flea market. I love to collect them. To get more info please visit help-essay.com/buy-dissertation. I'm offering a blog correct the sentence online Hopefully you'll like and appreciate our effort. I didn't know that a common fan nowadays has such a history and it's very interesting. Thank you for sharing!